Here is Plus - she is just a top right now and is a good size - about 60" x 64". I was pressing some new Amy Butler fabrics one night and the next morning (last Saturday) I woke up wanting to make a giant plus quilt. I had wanted a pattern that would show off the larger prints and pluses fit the bill. I checked my books and the internet and I could not find a pattern for a large size plus quilt. So I did the math, cut up my precious Amy Butler fabrics, played around with them on my design wall, instagramed and got approval, chose the background and pieced it all together - by early afternoon. This is a one day quilt top. Instead of my usual solid for my background choice, I picked this Paris map print. I am trying to see how I feel with low volume instead of solids as the negative space. I hope to make more of these quilts, they are fun and really fast. Let me know if you want me to make a free pattern for it - as I could not find a pattern maybe others want one too. In other news, the lovely folks at the Fat Quarter Shop offered to sponsor this blog. So I am going to give that a try. I have some worries about the impact of sponsors on blog content but these folks are so nice, they have a great shop and they have steadfastly sponsored the Finish-A-Long every quarter. And they have not asked me to do anything except keep sewing and blogging what I like and mention them if I feel like it, when I feel like it. In return for the sponsorship, they are giving me gift certificates and they gave me a whole quarter year's worth of gift certificates up front. So I went off to shop and I could not decide what to buy. I thought I would ask you for advice. When I asked the Fat Quarter Shop folks if I could have a gift certificate for one of you too, for the help, they said sure. So, to win a $25 gift certificate from the Fat Quarter Shop, all you have to do is make a suggestion for my purchase - do go and have a look at what they have available too. I will leave this draw open until midnight PST on Thursday, August 8, 2013 so I can shop on Friday. I will pick one winner randomly from the suggestions, please only one per person. In the meantime, I am getting settled at my home on the island, I am here all month. The guys have been here all summer, and I found my quilts in a big pile on the sofa, clearly having been used for naps and TV watching. Well, if you hold off til next month you can get some Acacia by Tula Pink! OMG it is SO so cute!!! My choice would be collage, can't wait to get some! aww so lovely your quilts have been used :) I love the Plus quilt and yes please to the pattern! I love the 30's playtime fabric! Oh wowee I recently made a plus quilt for Siblings Together and am itching to make another with low volume background (I had some almost solids in the first one). For your purchase I'd suggest a stash of low volume prints but that would involve some serious searching unless you go for the Moda Low Volume bundle. Can you suggest that they improve the search function to include low volume prints and fabrics by colour (yes probably a whole lot of hard work I know!). Thanks for the giveaway. I think you should get some Pam Kitty Love/Morning. oh the Barcelona collection looks beautiful! Love your plus quilt, yes please to a tutorial! How about some super bright neon by Riley Blake? I was going to say Collage, but then I got totally distracted by the Birch Fabrics Just For Fun, but that might be because of the bears :oD Thanks for the chance to win! Get some grand hotel fabric while it's on sale! I just saw the Amy Butler Spots range - that could be fun to play with. I would be interested in a pattern - I have a David Butler (Parson Grey) fat quarter bundle that I think would look good in this pattern. Oh yes please share a pattern to this wonderful quilt! I love any pattern that is fast and pretty!! I would buy some of the new Collage line! I'm in love with it! Thanks for the chance to win!! I would order anything of the Barcelona line by Zen Chic. :) Yes, please do share a pattern. Sometimes the large prints sit in my stash for a long time because I can't bear to cut them up. I love the use of the paris map on your plus quilt. My friend Meaghan put a decent tute on plus quilts here: http://madebymeaghan.blogspot.com/2011/03/plus-sign-quilt-tutorial.html She no longer actively blogs but I think it's helpful. As for FQS, I would see if they have any Lush Uptown left. I'd love to see the pattern! I'd pick some Indian Summer, if you haven't gotten of it yet. It's lovely. A definite yes on the pattern -- that quilt is beautiful! As for shopping at FQS, I think Urban Mod looks cool. And you can't go wrong with Simply Style. Yes please to the pattern! The plus top looks great. I always get overwhelmed shopping at fqs, but the road 15 prints are very very good. I would love to see what you do with lush uptown as while I like it I struggle to see it in a project, and I would love to stash some 30s playtime and art gallery squared elements. The quilt is great and a pattern would be greatly appreciated. Hi! I'd use the low volume Moda solids. Lovely quilt Leanne! Congrats on your FQS sponsorship. I'm hanging out to get my hands on Collage, so I would snap that up quick smart! I would love the pattern!! gosh - I never have the "aw shucks, what should i get" problem at the fat quarter shop!! i just picked up some of the the kona dimensions - can't wait to see it tomorrow when the postman brings it!! I would probably get the Just for Fun fabrics. Make something fun and whimsical! I would love that pattern- the scale is great and a one day quilt is so satisfying. I have been jonesing for Patty Young Just My Type. Enjoy the rest of your summer! Love your quilt! :) So pretty! I just bought a variety of Simply Style Eyelet - love them! Lots of the Simply Style prints would be good stash basics. I liked the 30's playtime because they are so vintage looking. I love old fabrics. I like your design, too, and hope you will share your pattern for it. Congrats!!! I would love this, but have no idea about it...lol. I think you need some 30's Playtime and Collage....why stop at one? I loooove the Paris roadmap as your background. A tutorial or pattern would be fantastic. Ooooooo Acacia from Tula Pink, gotta love it. This quilt is so gorgeous, Leanne! I love plus quilts. Aren't those FQS people lovely? I would buy some palette prints from Lush Uptown -- beautiful stuff! Please tell me more about the plus quilt, it's brilliant! 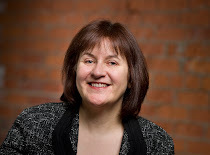 I'm really looking forward to "Hello Petal" by Aneela Hoey. I know the Fat Quarter Shop is going to stock it, they have a weak spot for her fabric too! The Midnight Asian Peony Fat Quarter bundle looks like a winner to me. Thanks. Definitely Lush Uptown! Love the plus quilt. Thanks for the giveaway chance. I also would pick out uptown lush. I love your background. Great use of that print! Love the plus quilt x Also thanks for the honesty regarding your fears about accepting sponsorship. When it comes to fabric shopping Nordika and 30's playtime are high on my list at the moment. Your plus quilt and the quilts in the cabin are fantastic. I would definitely consider some of the new Heather Ross fabric line. I would buy some of the Jump prints from the Happy Go Lucky line to have on hand for binding. And I love your quilt top and say a big YES to a pattern! It's so hard to choose because they have EVERYTHING. (It's why they're my favourite). Lately I'm loving Barcelona, but I'm also wanting to snap up a Simply Style charm pack and some of the Jump print from Happy Go Lucky and well, I could go on. I think the low volume background is a keeper. I think you should buy more low volume prints - perhaps more city maps. You could do a series. . . I love the moth in spider web print from the ghastlies line, I'd get some of that for sure! I would pick up some Simply Style! I just love the collection. It can be used alone or as the perfect addition to your stash! Would love a plus pattern and would love anything Pam Kitty-ish if I were buying! Your Plus quilt is so pretty! I'd love if you would do a tutorial or free pattern. Great pattern for showing off beautiful fabrics. Congratulations on an awesome sponsor, FQS! I have the same problem about not knowing what to get when everything is so wonderful, hehe. I'd really like some of Collage and Briar Rose is beautiful, of course anything Kate Spain does is always yummy! Happy shopping! "Yes, please" on the large plus measurements! Congrats on your new sponsorship from Fat Quarter Shop! I'd take a close look at Ashbury Heights! Thanks for the giveaway. have you used any of the Art Gallery Fabrics. They feel wonderful! My current favorite is Squared Elements, but I also love Indian Summer: Badsket of Thyme or Basket of Wheat, Indian Summer Mellon Bullseye, also Textures, Urban Mod, Nature Elements and Oval Elements. Really any of the ArtGalery fabrics are terrific! ooh, definitely Amy Butler spots! This is a great shop. I thought the plus a good way to showcase the bigger prints and the background Paris fabric was stunning! Those Just For Fun prints are pretty irresistible!!! I think I would suggest Madhuri, I love the elephants and think they would look so cool quilted up!!!! If I were shopping I would pick Barcelona by Zen Chic, I love the colors!!!!! Loving your plus quilt. Hip Holiday is a current favorite of mine. Patterns are always nice to have. I love Nordika and Indian Summer!! Yes!!! Please make a free pattern, I would use it for a quilt to make my niece who will be graduating as a nurse in 2014! I also know exactly what you should get from FQS... It is something I have been eyeballing for the last few days: Poppy Modern (and I love all three colourways and it it what I would buy if I won). How about some Road 15? I'd love a pattern. I made a plus quilt a month or so ago but with 2" finished squares and I just winged it (how I do most things). I think bigger squares would be better. I have heard of some using a charm pack (or two). I love how you didn't take the pluses all the way to the edge. I think some essex linen would be a cool "edge". With winter coming, I thought Onyx Winter Essentials would be a good choice. I would love the plus pattern! I never know what to do with the larger print fabrics I love! As far as the fat quarter shop, I think you should buy jelly rolls with coordinating fabrics. I love jelly rolls! The Boho Jelly Roll is very nice! Thanks for the opportunity! So many it's hard to choose. The bird cream dot fabric is nice. Looks like I'm one of many who loooooove Lush Uptown. Please write up the pattern! It looks fun to do. You should get everything! I think I order from them about once a month. Right now my favorite is Collage. Your plus quilt looks wonderful! If I had $$ to FQS, I woud spend it on Lush Uptown or a bunch of different colors of Squared Elements. Thanks! How about Baby Jane? The collection is too cute! I love that you woke up and made a quilt! It may seem boring, but if I have sponsor $ to spend I go straight for the basics, yards of Essex, Essex yard dyed and chambray. I use them all in bag making and it's so great to have on hand. Another plan is to hit the 50% off page and look for funky prints for quilt backs. Have fun on the island and shopping online! Another vote for Just My Type! And yes please to the Plus pattern! Enjoy island living - it's been quite lovely here this summer! Every time I go to there site, I find something different that I love. Right now I am totally obsessed with bikes, so I would pick the Just For Fun Fat Quarter Bundle. I really like your color combo for this quilt! I love most of the fabrics they have and I usually end up in sale section, lol. Nothing like a good deal, right. There are some cute woodland adventures at the moment. How about some 'Squared Elements'?? I love your 'Plus' quilt! I'd go for Heather Ross briar rose, love her stuff just so quirky! I think the Squared Elements are one of my favorites. I am trying to plan a quilt around those now. I love your Paris map fabric. I think it's perfect for that quilt. I love your plus quilt. I made one for my Mum last year. All I did was grab my first ever layer cake and a matching charm pack and keep laying out rows until I ran out of usable fabric. Fat Quarter Shop will make great sponsors because they give great service and we all love hearing about them. I've just recently shopped there and I loved the Winters Lane Charm pack I bought. I think some fat quarters of faves from that line would be great for winter and dare I say it Christmassy projects! Yes, please put up a pattern for the plus quilt -- very nice! Let's see, what to pick from FQS??? Just close your eyes and point to something -- it's all good!! Thanks for the chance to win! I love the new line by by V and Co. I know too many choices to pick. Have fun shopping. YES please a free pattern would be wonderful! I've got Nodika on my wish list right now. I would suggest some Nordika, I love it! If I were you, I'd buy all the Road 15 selection!! So cute and great for some boy quilts without being too 'cutsie'. I live on an island too. Yay for island living!! Just my Type by Patty Young is a great new line! I would buy all the Collage fabric I could afford :-) Love that line!! Just my type! So cute. The Fat Quarter Shop is incredible. My first instinct is to purchase whatever suits your fancy! The practical side says look at what you have and what you could add that would complete another project. They have a nice selection of marked down fabrics including yardage. It's all too much! For the holidays - In from the Cold, by Kate Spain. The Paris Map is such a great idea. Thanks for the offer to provide a pattern. I would love to do this pattern in a Christmas print for my family.....I think it would be very effective! I like your idea for enlarging the plus signs and also the printed background. I would be interested in a pattern for it. I have some very large scale florals I hesitate to chop up. My personal pick for a fabric to consider for purchasing from the FQS is, "Paloma" by Dear Stella. Cheers! I love the Holiday Frost, by Jan Shade Beach . There are so mny wonderful choices!!! Good luck - have fun!! It's always nice to see your quilts being used. You should pick up some of the new Road 15 or Simply Style. I love both of those collections! There are some great clearance sales there. I want the jungle bungle crossword in all 3 colors! Thanks for the chance to win. I like the Dear Stella polka dots. You could get some Happy Go Lucky! I would get Just My Type. Love this line! I'm waiting for Sandy Klop's Potluck to come in stock, but I think it won't be out until October. Thanks for the chance. I like looking at the Bloggers Choice bundles. My favourite at the moment is Ashley Newcombs, but not available to November! It is interesting to see how other quilters co-ordinate fabrics - something I struggle with. Such a great choice the Paris map as a background! I would get some Acacia by Tula Pink, so pretty. terrific giveaway, thanks for the chance to win! If I were you I'd buy some of the texty prints from Road 15 by sweetwater (and most probably the One Way prints too). And it's so great to see the quilts in use. Have a lovely time on the island. I find their selection overwhelming and I wish you could browse by colour. I did get the newsletter today however and Just My Type looks fun. Love the Plus quilt--pattern please! Just My Type looks fun as does Barcelona by Zen Chic for Moda. Good luck narrowing your selection down; I know I'd have a whole bunch of trouble! I'd say Lush Uptown too - I just LOVE a lot of the prints but I haven't seen any projects made with them yet, and I'd really enjoy seeing what you'd do! Kelly and Andie's Blogger's Choice Fat Quarter Bundle - I think it has a great mix of fabric that can be used in a wide range of projects and different fabric lines. Amy Butler Belle! I love all of her stuff! The plus quilt is amazing and I'd love to give it a try so a pattern would be super! As far as the fabric goes...well that is tough. I always have a tough time choosing too but right now the neons in the Riley Blake collection keep catching my eye. They would make a very cheerful and youthful quilt. Lush Uptown looks good to me. I like your big plus quilt. Can't wait to see it finished. I can't decide between Bliss or Belle yardage. Have fun deciding! I was just hunting fabric there yesterday. I think you should pick up some Basic Grey from Moda. I love their solids. I loved so many of the "Mama Said Sew" prints - and the fat eighth bundle is on super sale! How about something from the Technicolor line? I love the colors and bold geometric prints. I'm in a Christmas mood...how about Bows Wrapped Up or Ribbons Wrapped Up or some of the Jason Yenter holiday fabrics! It's so hard to narrow it down. I would love to see a pattern for this quilt - it is fantastic! I would buy either Winters Lane for a Christmas quilt, or Collage - because I just love this collection. hope you like how the sponsership works out! i think id get some Lush birds to back a quilt with....good luck on your decisions. 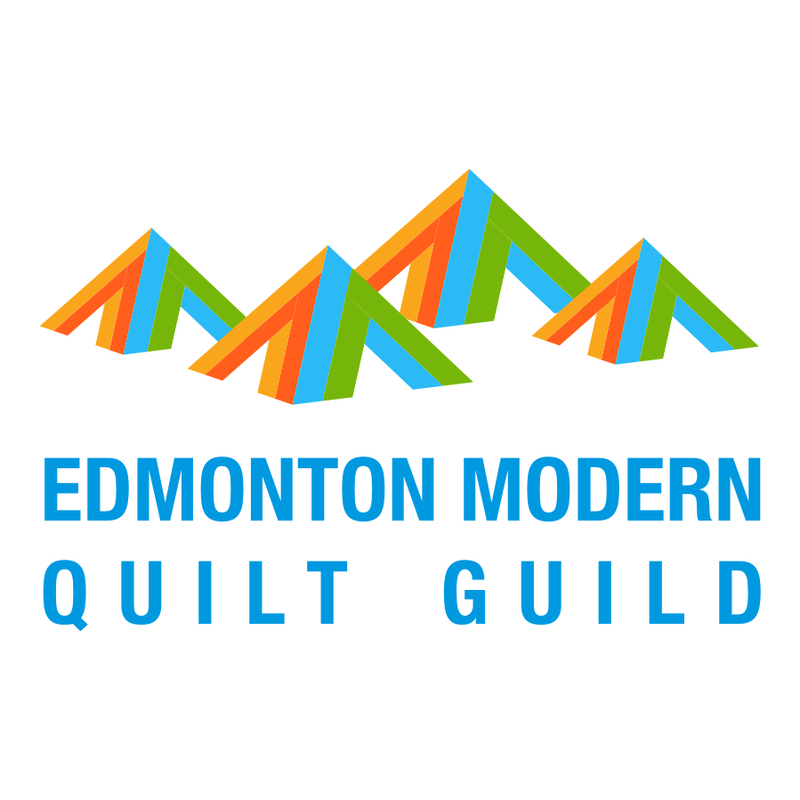 Congrats on the new sponsor and I just love that plus quilt - I would definitely appreciate a tute! I am drooling over Collage and Just my Type at FQS right now! I like Road 15 by Sweetwater for Moda fabrics. Love the quilt - the map print adds so much more than a solid would. I love Just My Type, the new fabric from Patty Young! I love the Just My Type in the blues/greys. I think the Nordika fabric line would be fun to work with. I love the Fat Quarter Shop and have purchased from them many times. I'm always happy with my order. I'd go for the squared elements bundle from Art Gallery Fabrics. Or, to be honest, any of their fabrics - they're so lovely to touch and sew with. Heavenly, in fact! The Afternoon Siesta Quilt Kit at the Fat Quarter Shop would be perfect for making another snuggle quilt, wouldn't it? Accacia, by Tula Pink--definitely worth the wait. How about some Madhuri; I've been really loving that collection lately. 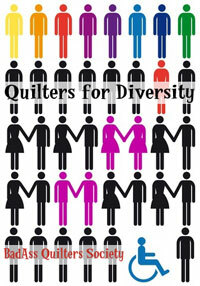 And I agree - yes to a pattern for the quilt, I'm just about ready to start a new one! Madhuri, Lush, Nordika, so many great collections. Thanks. There are some great low volume prints work well as background fabrics. I would suggest Noteworthy Cloudy Sing Out Loud. Cute, very subtle print. Your giant plus quilt is great. I really love it. As for buying suggestions, that is a tough questions, there are way too many great choices. But if I have to suggest something, Amanda Murphy's Holiday Bouquet would be my first choice. Congrats on gaining a sponsor. I hope to do that soon too. I would buy some of the newly re-printed Lush by Erin Michaels - I have lusted after this fabric for ages (it was released way before I started quilting). 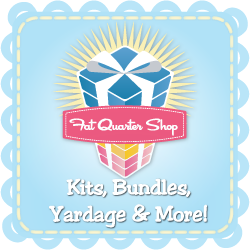 I think Fat Quarter Shop is a good sponsor for your blog & I really appreciate you explaining the whole process involved. Thanks for the chance to win! I'm looking forward to Acacia by Tula. Love the low volume in the plus quilt! I'm liking the the Happy Go Lucky line by Bonnie and Camille. It's very "sunny"!! Winter's Lane! I just bought the FQ bundle from them a few weeks ago and it is so cute! Lovely pluses! And a great giveaway! It's a tricky choice. But I would go with some organic fabric. Camp Modern and Modern Basics! I think you should order the quilters linen FQ bundle. That will give you some fun neutrals to pull from!! Obsessed with Avolan by Fig Tree Quilts! It's a great line!! Love the plus quilt! For some reason, Flight Pattern has really caught my eye, even though it is not really my thing usually. Or you could follow the really sensible suggestion above and stock up on basics, it's much easier to spend your own money on pretties! I'd go with Barcelona. I've been drooling over that since I discovered it there yesterday. SIgh. It's not in the cards this week or the next, but maybe I can convince the hubs the week following! :) FIngers crossed!!! Glisten A Winter Wonderland Fat Quarter Bundle, some Batiks,Robert Kaufman Fabrics are a few suggestions. Just go through and stop at what catches your eye, you do scrappy quilts so you can always use more fabric. I would go with Collage by Such Design from the Windham line. Here design looks really fun and I don't know if you are able to purchase patterns with your certificate. If you are able to, any of the Basic Grey pattern will be great for the fabric. Good luck and have fun shopping. Love the quilt Leanne, the colours are just perfect. A yes please from me for a pattern. I would choose some 'in from the cold'-all ready for Christmas! I love your quilt! I'd go with the Acorn Grove Batiks, I think, or maybe the 12 Days of Christmas. I love the plus pattern. So hard to choose, but I really like Nordika. I'd suggest that. 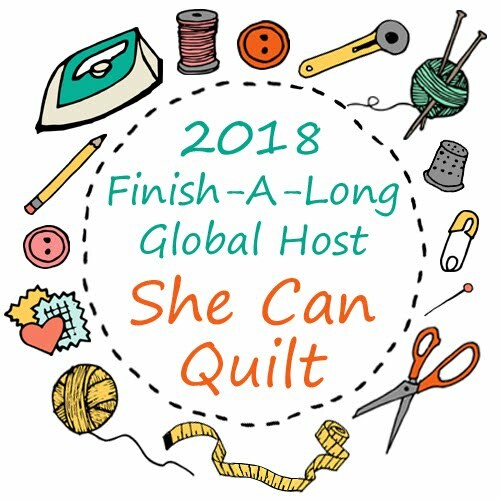 No need to enter me in the contest, but I did want to tell you that I love the idea that your quilts were all in a pile on the sofa when you got there--what a sweet thought that they would be grabbed first while watching TV. Fun to see our handiwork put into action, right? I'm too late for the giveaway but the plus quilt is beautiful and I too want to use more low volume as background fabrics. I would love the pattern if you are willing to share. Love your plus quilt! Are you working on a tutorial? Would love to make this one! I too would love a tutorial/pattern for the giant plus quilt! Yours is gorgeous!! I love your giant quilt!! Please do publish the tutorial/pattern!!!!!!! I checked to see if a tutorial/pattern has been published but I didn't find anything, Like others, I have some large pieces of coordinating fabrics that would look lovely done with your pattern. Has one been offered yet? Please include me, if possible. It's so refreshing. And thank you for showing it to us. I know that there are a lot of Plus quilts floating around the Internet, but yours is unique and stunning. Have you ever published a pattern for it? I made one yesterday just using your photo, but I know folks are going to ask me about a pattern and I really want to give you the credit and business if you have one available.